From antiquity until about the 19th century, the involvement of women in art might be summarized as “clothing optional”. Women mostly served as models, expected to maintain their dignity even while holding ridiculous poses. Creating art was considered to be the province of men; for the most part, women were not permitted to hold a palette or a chisel. There were some exceptions down through the centuries — there were indeed women who established themselves as artists — but unless you were an Art History major, you’ve probably never heard of any of them. So let’s start by giving some credit to a man, a relatively minor painter named Orazio Gentileschi, who recognized and encouraged his daughter’s talent way back in the early 17th century. Artemisia Gentileschi painted in the Baroque style to great effect. Trust me — if you’re wandering through the Uffizi Gallery in Florence and come across her painting called “Judith Slaying Holofernes”, you’ll stop and say “Whoa!” Her contemporaries (men) acknowledged the quality of her work; Artemisia was the first woman accepted into the Florence Art Academy, which was a big deal. You’ll see Artemisia Gentileschi’s name in art books, but if you come across the name Le Brun at all, it usually refers to Charles Le Brun. King Louis XIV called him “the greatest French artist of all time,” an assessment that now seems as over-the-top as Louis’s pet project, Versailles. The Le Brun I find interesting, however, is Elisabeth Louise Vigée Le Brun (her husband’s great uncle was Charles Le Brun). Elisabeth’s father was an artist of no repute, but he taught her a bit about painting before he died of complications from choking on a fishbone. Her mother subsequently married a jeweler in 1768 and the family moved into a neighborhood near the Royal Palace in Paris. Elisabeth got to know her aristocratic neighbors, and they got to know her work. By the age of 15, she was making good money painting their portraits. That brought her to the attention of authorities who threatened her with arrest for painting without a license. Makes you wonder what one had to do to qualify for an artist’s license, doesn’t it? And were the ID pictures on artist’s licenses as awful as the pictures on driver’s licenses are now? Well, let’s jump ahead to 1778, when Elisabeth Louise Vigée Le Brun painted a portrait of the queen, Marie Antoinette. Over the next several years, Elisabeth was commissioned to paint something like 30 portraits of Marie Antoinette, and lots more of other members of the nobility. Then the French Revolution happened. Madame Vigée Le Brun got out of France with her head still attached and continued painting aristocrats in other European cities. 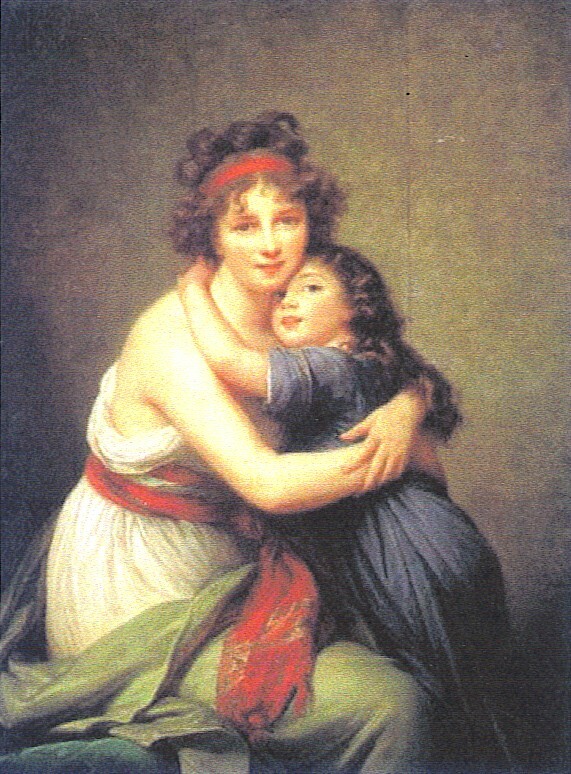 She eventually returned to Paris, where she died in 1842. To be honest, I’m not a big fan of her work, which is in the Rococo style. As I may have mentioned before, the fussy sentimentality of Rococo tends to trigger my gag reflex. In spite of that, I admire the technical skill with which she handled her brushes, and I think it’s worth calling attention to artists like Elisabeth Louise Vigée Le Brun, whose success helped open doors for generations of women artists who followed. This entry was posted in Art and tagged Artemisia Gentileschi, Elisabeth Louise Vigee Le Brun. Bookmark the permalink. Hi Tom I have a minature portarait on some sort of metal of Madame Elizabeth vigee Lebrun and daughter it looks extremely old I was just wondering if you know of anyone I can get some advice about it from I would like to sell it but I have no idea about what it’s worth if it’s worth anything I can send pictures to you if you can help. Thank you I look forward to hearing from you. I’m not qualified to give you an estimate of the worth of the object you have, but I can suggest a couple of possibilities for you. First of all, you might like to do a search on eBay or Craigslist to see if comparable pieces are being sold there. That might give you some idea of what you have, and what it’s worth. If you live in or near a metropolitan area, there are antique dealers or art galleries that would have people who have the kind of knowledge I lack in determining value. Of course, it’s not worth much if no one wants to buy it, but if what you have is indeed a likeness of Madame Lebrun, I would think that there is someone out there who would like to have it. Here’s another possibility: My wife and I had an old piece of art and really had no idea of its value, so we took it to a museum and asked an expert there. It turned out to be worth something, but not so much that selling it would change our lives, so we decided to hang onto it. The point is, if there is a museum near where you live, perhaps someone there could give you some advice and direct you to a reputable art dealer. It’s exciting that you have this little treasure, and if you do get some help from an expert, please let us know about it by posting another comment here. Good luck!